Christmas themed Penny Black slapstick cling stamp featuring an elf Christmas Stocking. This clear stamp set features Santa on his sleigh, boy elf, girl elf, two reindeer, present, tree, snowflake, candy cane heart, and a variety of sentiments! "Merry & Bright" "Tis the Season" "Elves are just fun-sized friends!" "Prancing through the snow!" "Santa Claus is coming to town" "Ho Ho Ho" Sleigh bells ring!" Merry Christmas" Includes 15 pieces. Christmas themed cling stamp featuring an elf. Christmas themed wood mounted rubber stamp from Hero Arts featuring elves. Hero Arts woodblock stamps originate from sustainably managed forests. They are hand-cut and assembled by Hero Arts in the USA. Each design is an imaginative original, and a lasting keepsake. 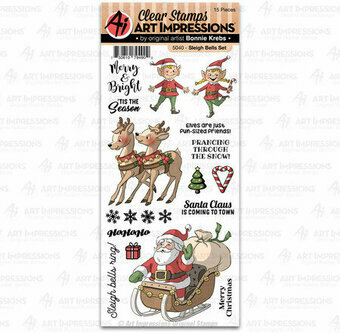 Christmas themed clear stamps from Lawn Fawn featuring elves, "You're on my nice list", "Merry Christmas", and more. From Birdie Brown, we bring you Jingle All the Way. Festoon your projects with this jolly little elf engaging in a variety of joyous holiday activities. Coordinating images, including a darling girl, reindeer, present pile, and tree, serve to accessorize the impish fellow. The playful style of the illustrations in this set will provide endless opportunity for happy coloring. This 13 piece set coordinates with the Jingle All the Way Die-namics and includes the following elements: Santa A 1 1/2" x 2 1/4", Santa B 1 3/4" x 2 1/4", Santa C 1 1/2" x 2 1/2", Tree 1" x 2", Reindeer 1 1/4" x 1 3//8", Gift 3/4" x 1", Girl 1 1/4" x 1 5/8", Santa Has Some Favorites and One Is You 3" x 3/4", You're a Deer 1 5/8" x 3/8". Our clear stamps and Die-namics are made in the USA. Christmas themed cling stamp featuring an elf and the sentiment "Celebrate the spirit of the season".